Use ginlo @work to collaborate efficiently in teams and on projects. ginlo Team Manager is the IT department's command center. For security reasons, it’s not a web portal, but a lean and intuitive desktop application. You want to communicate securely and in compliance with GDPR? All data in ginlo @work is fully encrypted – that’s more than end-to-end. You – and only you – have the sovereignty over all keys and thus over all data. 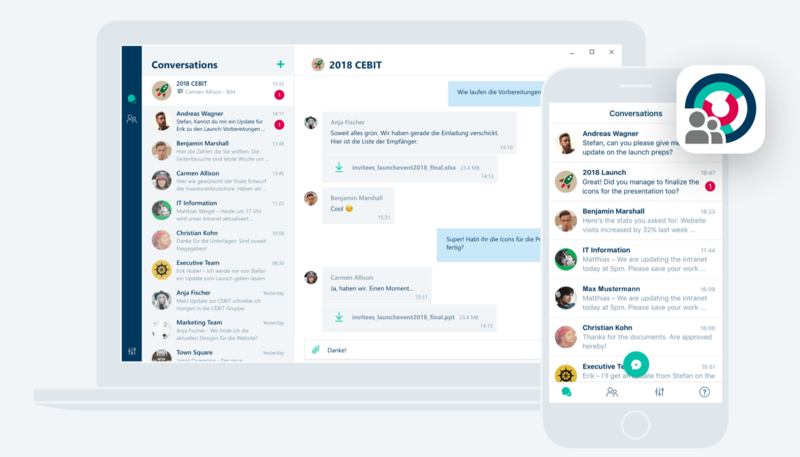 End-to-end encryption of all message content. Local data encryption on the device. Encryption of databases including metadata. User-generated passcode to protect access to the app. Hierarchical encryption for full data sovereignty. Hosting exclusively in ISO-certified data centers in Germany. As a German provider, we are subject to data protection laws that are among the toughest in the world. At the same time, the use of ginlo @work is compliant with the new European General Data Protection Regulation (GDPR). Data is processed and stored exclusively in Germany and thus in the EU. Zero-knowledge approach to minimize data collection on our part. Audit-proof archive of all correspondence. Data processing with state-of-the-art security technology. Hosting exclusively in certified data centers in Germany. No credit card required. No commitment. No automatic renewal. Our Customer Care is always there to help you.